If I haven’t expressed it yet, I love to cook. I really love cooking. It’s a hobby, a need, a getaway, and a creative expression. I like the science behind it as much as the process, flavors, origins, and beauty of food and cooking. Vegetables, fruits, meats, cheeses, spices, sauces, pastas, rices, seafoods, herbs, and much more are all variables in a world of infinite combinations. Because something doesn’t show up in a recipe book or google search doesn’t mean it’s not good. It just means it may not have been done yet and you are the lucky one that gets to put it together! As with a few other random things (flying, reading, creative writing, building, etc), I find it hard to believe some people don’t like cooking. I think it is more intimidation and laziness than a lack of know-how or anything else. There are so many simple yet delicious dishes one can make that the “I just don’t know how” excuse doesn’t work for me. Hit the store, talk to the butcher, ask a neighbor, jot ideas down, look at pictures, buy a book, and just go at it. If you mess up, you learn for next time. You have to make cooking a lifelong learning process. Learn to enjoy sharing what you cook. Honest feedback from multiple palates is most valuable in adjusting for your next dish. The ongoing learning process can then move you to experiment more and trust your instincts and senses more than to just use your ability to read and follow directions. That doesn’t mean books won’t always help you. As my mom says, everyone should have the ultimate reference book in their kitchen – The Joy of Cooking. For other old, traditional references, book sales, tag sales, and local festivals are great places for these. On the other hand, you can always find new, innovative approaches to cooking at the local book store. I just grabbed a good one the other day: Ratio – The Simple Codes Behind the Craft of Everyday Cooking (by Michael Ruhlman). If something inspires thoughts for your next cooking experience, it’s worth it. Finally, I want to note that these days, easy access to food can almost be considered a privilege. For that reason, it’s certainly a privilege to have easy access to a wide variety of foods. So if you have a nearby grocery store, go look around. There are A LOT of foods out there that someone else might not have the chance to eat. If you get flustered, go grab some juicy California oranges and soft McIntosh apples and come back another time. 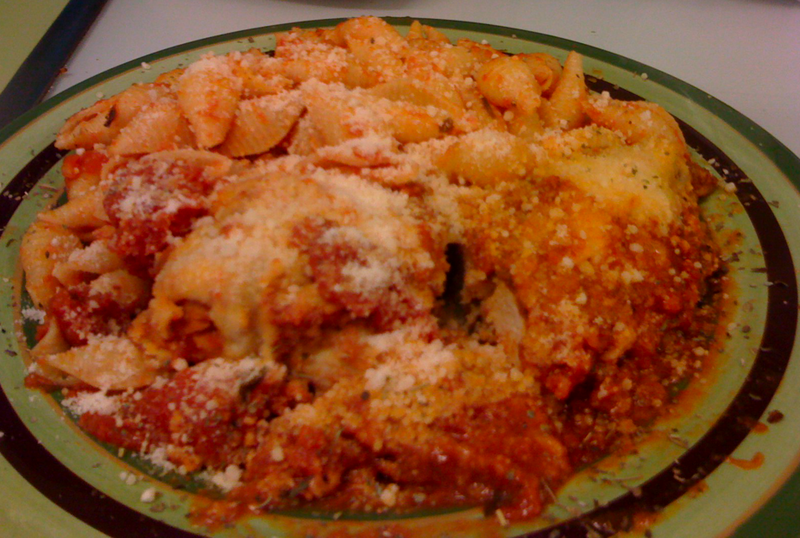 Note: Picture above is a homemade chicken parm and shells with homemade tomato sauce and fresh parmesan cheese. good call! steak panini and pot roasted pork look very very good. he needs to add more pics! A few years ago I’d have to pay someone for this infortimaon.